On the eve of the centenary of the shocking assassination of Rosa Luxemburg just a week ago, the Guardian described Rosa and her followers as “radicals” (the no longer visible original headline on the website’s front page described her as a “German radical”). Since when is a pacifist “radical”? Only in a world where violence is the norm. The Guardian is quietly implying that conflict is the status quo and demanding peace is absurd. A little bit like they do to Jeremy Corbyn. A profoundly twisted perversion of values. 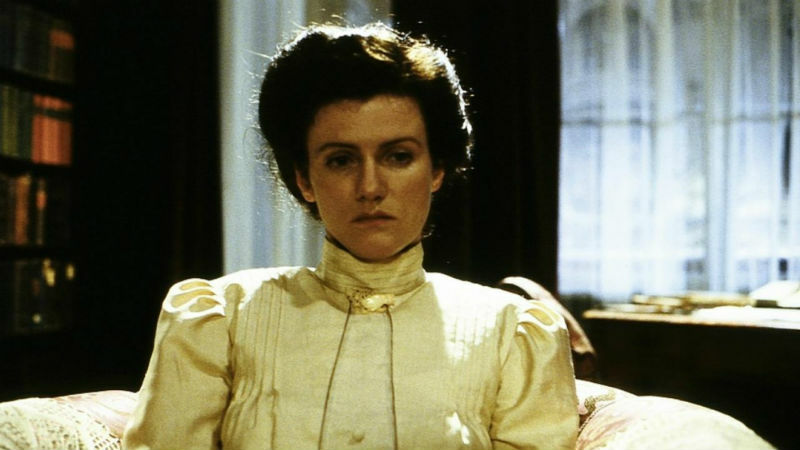 Thankfully Margarethe von Trotta’s biopic of Rosa Luxemberg is now being released in order to reveal/remind us that she wasn’t a “radical” politician, but instead a very balanced, ethical and passionate human being. The 121-minute drama featuring a stunning Barbara Sukowa (best remembered for Fassbinder’s Berlin Alexanderplatz, 1981, and Lola, 1981) zigzags back and forth in time between Rosa’s youth in Poland up until her untimely. murder on January 15th, 2019. She was assassinated in Berlin, her body dumped in a local canal. Sukowa won the Palme d’Or for Best Actress. She’s profoundly convincing as she passionately delivers her “deeply subversive” speeches about working class revolution, “war against war”, “living together in piece with our French brothers”, and paving the way for a general strike. Her helplessness at Reichstag voting unanimously for war is entirely palpable. Her view is that the proletariat must stand up and fight against their bosses (and not against the proletariat in other countries). The proletariat must stop production in order to thwart the ambitions of the ruling class, in simple Marxist terms. Rosa Luxembourg is a generally simplified view of a very complex succession of political events. So convoluted that those unfamiliar with German politics 100 years ago might struggle to follow the story, despite the director’s nearly didactic approach (the speeches are simple and direct enough for anyone to grasp). Rosa Luxembourg and her comrades Karl Liebknecht and Clara Zetkin founded the German Communist Party (KPD), which competed against the socialists of the SPD (which presently govern Germany in a coalition with Angela Merkel’s CDU). Both parties claimed to be Marxists, but there is very little doubt that the former was far more committed to the communist ideals. She grudgingly agreed to the Spartacist uprising in January 1915 in an attempt to seize power. Upon realising their defeat, Rosa expected to be imprisoned, but was instead summarily executed. The German filmmaker and feminist Margarethe von Trotta focuses on Rosa’s pacifist credentials, demonstrating that she encountered resistance even within the party. She met with dismay the news that her associated Liebknecht encouraged workers “to beat their bosses to death”, at least according to a local newspaper. She believed that the class struggle consisted of striking and political manoeuvring, and that a bloodshed should be avoided at all costs. 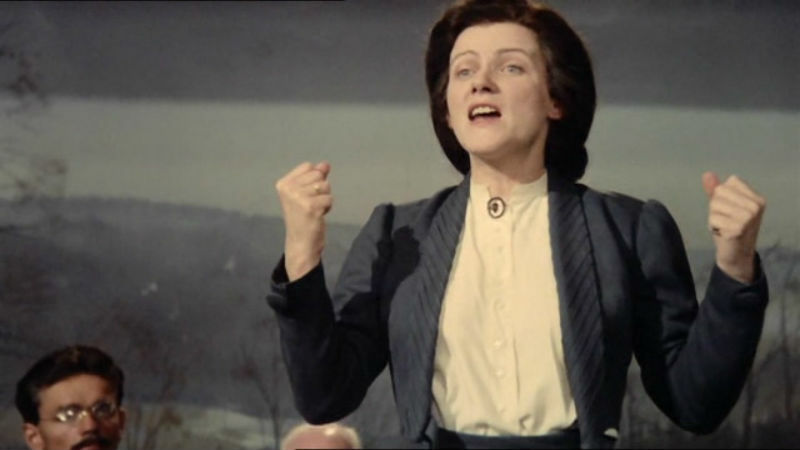 Her views put her at odds with Lenin, who believed that war was justifiable as long as it was for “national liberation” instead of imperialistic purposes – a fact strangely neglected in the movie. Rosa’s duality as a female and a revolutionary is a addressed throughout the film. She was advised that motherhood makes one fearful, and urged to choose between having babies and the revolution (“Who are your real children?”, she was asked). At one point, Rosa is described by her male comrades as “argumentative” instead of “courageous”, a tactic familiar to all women who have been a victim of misogyny and gender bias. Some of the most powerful sequences in the movie include Rosa’s nighmares of war. Real black and white, somber and grainy war footage are used in order to illustrate Rosa’s fear of conflict. She’s painted as a selfless individual who suffers enormous pain when others become a victim of violence and injustice. Her letters to Sonitschka (Karl Liebknecht’s wife) while in prison are also central pillar of the film, when Rosa’s talent and eloquence become most conspicuous. Overall, Rosa Luxemburg is a powerful historical drama, with excellent performances, photography and an invigorating music score to support the events. The topics of pacifism and class struggle remain as pertinent as ever. Rosa Luxemburg is available on DVD, Blu-ray and also for digital download from Monday, February 4th. The new release commemorates the centenary of the revolutionary’s assassination.